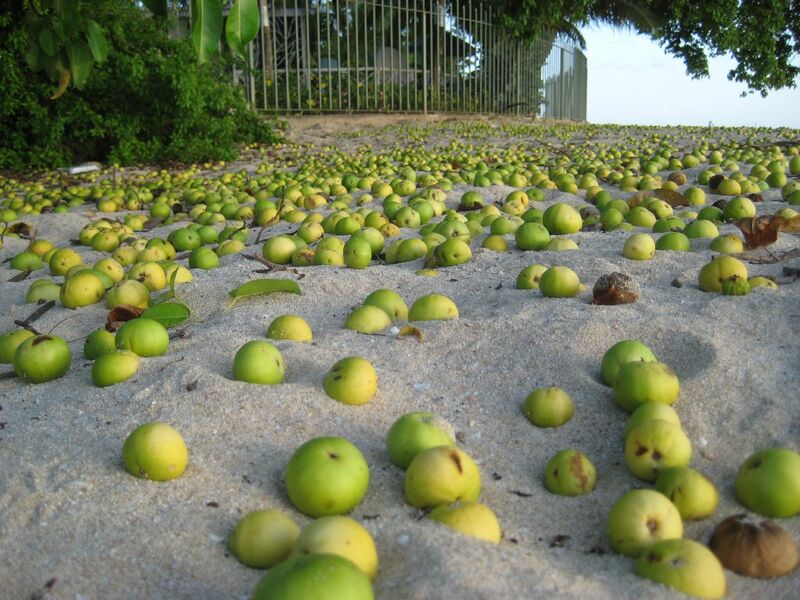 The manchineel is an unostentatious looking tree with bright green oval leaves. It grows up to fifty feet and is native to the Caribbean, South Florida, Northern South America, and Central America. It has a grayish brown bark and sweet-smelling green fruits, which have been termed as little apples of death. Eating these fruits can cause vomiting, abdominal pain, bleeding, burning, and blistering on the throat and mouth. It can even be fatal. It is not just the fruits of the tree that are dangerous. In fact, every part of it is. The bark, sap, leaves, and fruits are all lethal. The tree is so dangerous that it is marked with red bands and warning signs all over. 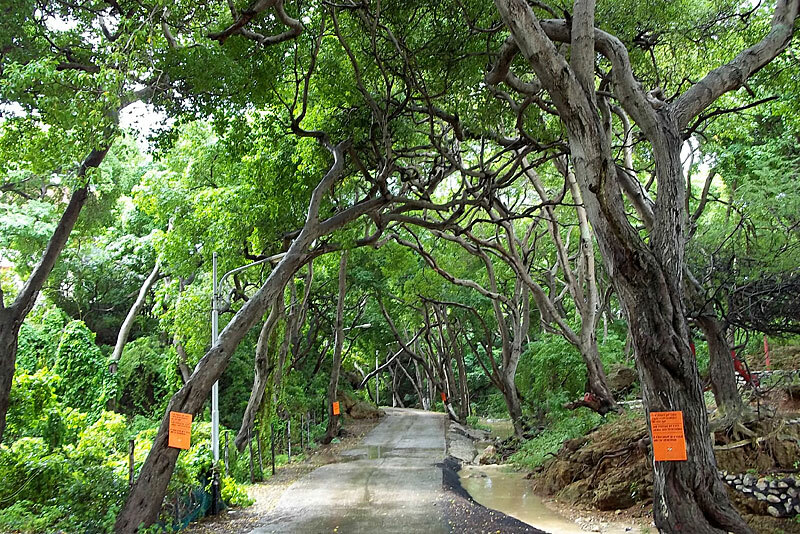 Tourists and travelers who are not familiar with the tree are often warned about its dangers. They are advised to stay away from it and never to attempt touching any part of the tree. The milky white sap of the tree is highly caustic. If you come into contact with it, you may suffer from rashes, headaches, severe breathing problems, acute dermatitis, and even temporary blindness. Spanish conquistadors in the 16th century by making them stand under these dangerous trees during the rain. They also poisoned their darts and arrows using the caustic sap of the trees. The bark is highly dangerous too. Chopping and burning its wood is discouraged as the sawdust and smoke can be harmful to the eyes, lungs, and skin. 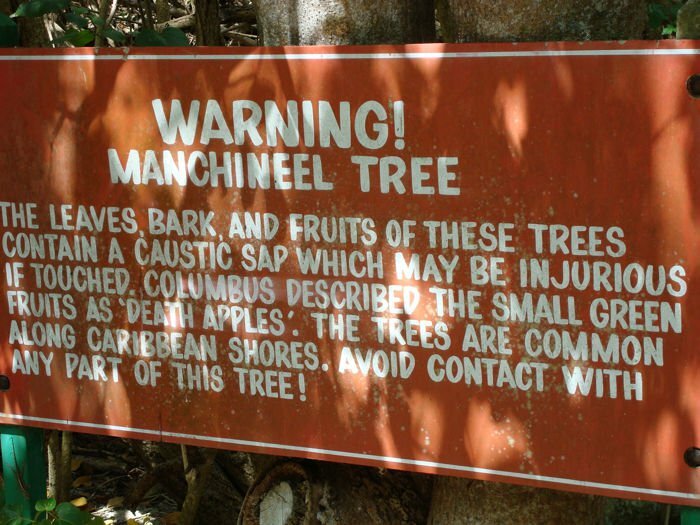 Nevertheless, despite the dangers of this tree, people still use the manchineel’s wood for furniture, bark for disease-treating gum, and dried fruits for diuretics. Sadly, the tree is now endangered.